When working with fine objects or tools, a good sense of touch is vital for ease of work. The MCR Safety GP1006PU Coolmax PU Palm Coated Safety Gloves are made with light and breathable Coolmax and are designed for a great fit, making them incredibly comfortable and easy to wear. 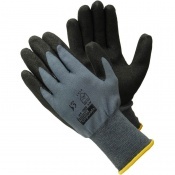 With a PU palm coating, they offer an improved sense of touch and dexterity – perfect for fine handling tasks. For exceptional comfort, the MCR Safety GP1006PU gloves are made from incredibly lightweight Coolprene. Not only does this material make the gloves feel great on your hands, it's also incredibly breathable, wicking moisture away from your hands and keeping them feeling fresher for longer. 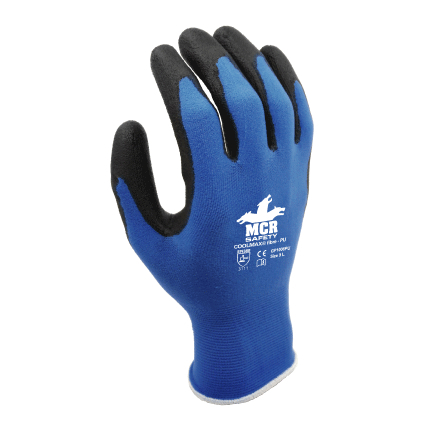 To ensure your hands can move freely as you work, the MCR Safety GP1006PU gloves have been developed to provide an incredible fit to hands. 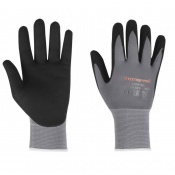 This enables you to work more easily, and makes them great for all-day wear. 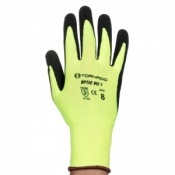 The PU finger and palm coating on the MCR Safety GP1006PU gloves make them ideal for fine handling tasks. The coating provides you with an improved sense of touch – perfect for holding small objects or tools where dexterity is important.